The 20th European Women’s Championship takes place in Antalya, Turkey, Thu 11th Apr to Tue 23rd Apr 2019. Top seeds Aleksandra Goryachkina, Nana Dzagnidze, Bela Khotenashvili, Alina Kashlinskaya, Antoaneta Stefanova etc. The German Bundesliga took place 10th November 2018 to 7th April 2019. This is the strongest national chess league. The league suffered a blow this year with the very last minute withdrawal of DJK Aufwaerts Aachen. Baden Baden retained their title in the final weekend, a major part of that was beating closest rivals SG Solingen 5-3 in round 14. The Israeli Team Championship took place Sat 5th Jan 2019 to Fri 5th Apr 2019. Games available. I don’t have a final table yet but Ashdod Elit seem to have won the event. The US Chess Championships took place 20th March to 2nd April 2019. Players: Open: Caruana, So, Nakamura, Dominguez Perez, Shankland, Robson, Xiong, Sevian, Lenderman, Akobian, Liang, Gareyev. Hikarua Nakamura shared the lead with Leinier Dominguez and Fabiano Caruana going into the final round, he was the only one of these players to manage a win so he won his fifth title with 8/11 half a point clear of these rivals. The women’s championship saw a remarkable performance by 17 year old Jennifer Yu, she was not at all one of the favourites but demolished the field with a fine 10/11 score. The 20th European Individual Championship took place in Skopje, Mon 18th Mar to Fri 29th Mar 2019. Vladislav Artemiev took first place from Nils Grandelius on tie-break after both scored 8.5/11. There were a total of 22 places available for the Khanty Mansysk FIDE World Cup later in the year. The 1st Prague International Chess Festival took place Tue 5th Mar to Sat 16th Mar 2019. There is a strong Masters Group Jan-Krzysztof Duda, Nikita Vitiugov, Radoslaw Wojtaszek, Pentala Harikrishna, Boris Gelfand, Samuel Shankland, Santosh Gujrathi Vidit, David Navara, Richard Rapport and Viktor Laznicka. The Challengers group was also of interest including includes Women’s World Champion Wenjun Ju, Alexei Shirov, young Indian player R Praggnanandhaa David Anton Guijarro etc Nikita Vitiugov won the Masters with 5.5/9. David Anton Guijarro won the Challengers with 6/9 and Hannes Stefansson won the open with 7.5/9. The FIDE World Team Championship took place 5th to 14th March 2019 in Astana Kazakhstan. 10 teams in the open and women’s sections. Leading players: Ding Liren, Grischuk, Nepomniachtchi, Yu Yangyi, Karjakin, Artemiev, Wei Yi, Bu Xiangzhi, Andreikin, Naiditsch, Amin Bassem, Adams etc. Play starts at 3pm local time, Russia have secured the Gold Medal with a round to spare. England scored one of their best team results ever in taking the silver medal. Second placed India lost to Russia in the final round and were overtaken by both England and China to finish 4th. The 11th dMP Batavia Chess took place 1st to 10th March 2019. Players: David Arutinian, Max Warmerdam, Arthur Pijpers, Simon K Williams, Stefan Kuipers, Koen Leenhouts, Rick Lahaye, John T.H.Van der Wiel, Lopez Jasel, Felix Meissner. Each day starts with blitz games. The idea was to produce draw odds for one player in the main classical game but this fell afoul of FIDE regulations so it will only be for unofficial standings. Arthur Pijpers won with 5.5/9 according to conventional scoring, I have no idea how the proposed alternative system using the blitz games worked out.. The St Louis Spring Chess Classic took place Sat 2nd Mar to Sun 10th Mar 2019. Two 9 round GM all-play-alls. The A-tournament has a very interesting field: Vassily Ivanchuk, Le Quang Liem, Ray Robson, Jeffery Xiong, Rustam Kasimdzhanov, Varuzhan Akobian, Illya Nyzhnyk, Benjamin Bok, Aryan Tari and Eric Hansen. 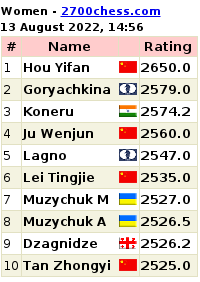 Jeffery Xiong won the top group with 6/9 half a point clear of Illya Nyzhnyk. Top seed Vassily Ivanchuk had a terrible result coming last with 3/9. Jinshi Bai won the B-Group. The 26th Bunratty Masters took place 22nd to 24th February 2019. Leading players: David Howell, Luke McShane, Nigel Short, Matthew Turner, Simon Williams, Alex Baburin, Alex Lopez, Mark Hebden, Bogdan Lalic, Peter Wells, Sam Collins, Adam Hunt, Malcolm Pein etc. Luke McShane won a blitz tie-break 2-1 against Mark Hebden to win the tournament after they tied on 5/6. The Saint Louis Champions Showdown took place Wed 20th to Sun 24th Feb 2019. Five matches: Pentala Harikrishna vs Fabiano Caruana, Jan-Krzysztof Duda vs Hikaru Nakamura, David Navara vs Wesley So, Veselin Topalov vs Leinier Dominguez Perez and Richard Rapport vs Sam Shankland. The players played 12 rapid and 24 blitz games. Final combined standings: Nakamura 29.5-18.5 Duda. Caruana 35.5-12.5 Harikrishna. So 28-20 Navara. Dominguez 22.5-25.5 Topalov Shankland 16.5-31.5 Rapport. The Graz Chess Festival took place 17th-24th February 2019. The top seeds in the open were Dmitry Kryakvin, Maxim Turov, Johan-Sebastian Christiansen, Andrei Istratescu etc but it was Viktor Gazik who won with a fine score of 8/9. In a 6 game match alongside the open Markus Ragger was a resounding 4.5-1.5 winner against Boris Gelfand. 43 year old Kaido Kulaots took first place on tie-break from Haik M. Martirosyan. Kulaots was 63rd seed and this must be the finest result of his career. The 1st Cairns Cup was a women’s tournament in Saint Louis that took place 5th to 15th February. 2019. Players: Alexandra Kosteniuk, Nana Dzagnidze, Valentina Gunina, Bela Khotenashvili, Elisabeth Paehtz, Marie Sebag, Harika Dronavalli, Zhansaya Abdumalik, Irina Krush and Anna Zatonskih. Valentina Gunina drew against her closest rival Alexandra Kosteniuk in the final round to take clear first place. The Cuban Chess Championship 56th Cuban Championship took place Sun 3rd Feb 2019 – Wed 13th Feb 2019. Carlos Daniel Albornoz Cabrera became the youngest winner at the age of 18. The PRO Chess League 2019 takes place Tue 8th Jan 2019 to the final on Sun 5th May 2019. 32 teams is divided into four divisions. Leading players: 1 GM Fabiano Caruana Saint Louis Arch Bishops 2827, 2 GM Shakhriyar Mamedyarov San Jose Hackers 2820, 3 GM Ding Liren Chengdu Pandas 2804, 4 GM Anish Giri Montreal Chessbrahs 2780, 5 GM Maxime Vachier-Lagrave Marseilles Migraines 2780, 6 GM Wesley So Saint Louis Arch Bishops 2776, 7 GM Ian Nepomniachtchi Moscow Wizards 2768, 8 GM Yu Yangyi Chengdu Pandas 2765, 9 GM Hikaru Nakamura Seattle Sluggers 2763, 10 GM Harikrishna Pentala Delhi Dynamite 2743, 11 GM Jan-Krzysztof Duda Cannes Blitzstreams 2739, 12 GM Sam Shankland San Francisco Mechanics 2722, 13 GM Le Quang Liem Webster Windmills 2715, 14 GM Francisco Vallejo Pons Barcelona Raptors 2713, 15 GM Dmitry Andreikin Volga Stormbringers 2712, 16 GM Vladimir Fedoseev Estonia Horses 2712, 17 GM Vidit Gujrathi Mumbai Movers 2711, 18 GM Pavel Eljanov Miami Champions 2703, 19 GM Rauf Mamedov San Jose Hackers 2699 and 20 GM Gabriel Sargissian Seattle Sluggers 2691. The Gibraltar Chess Festival took place 21st to 31st January 2019. 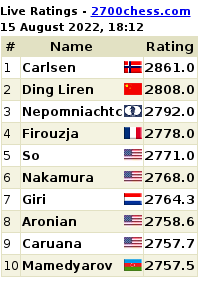 MVL, Aronian, Wesley So, Yu Yangyi, Nakamura and Navara are the top seeds in a field that has strength in depth. Vladislav Artemiev won with 8.5/10 half a point clear of Murali Karthikeyan.